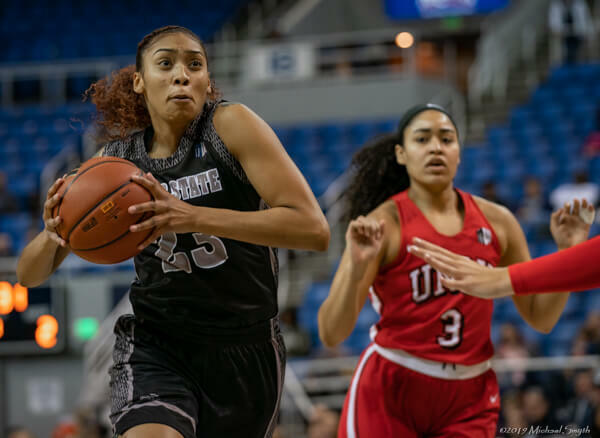 Nevada’s Terae Briggs drives against UNLV in the Wolf Pack’s win on Jan. 30 in Reno. 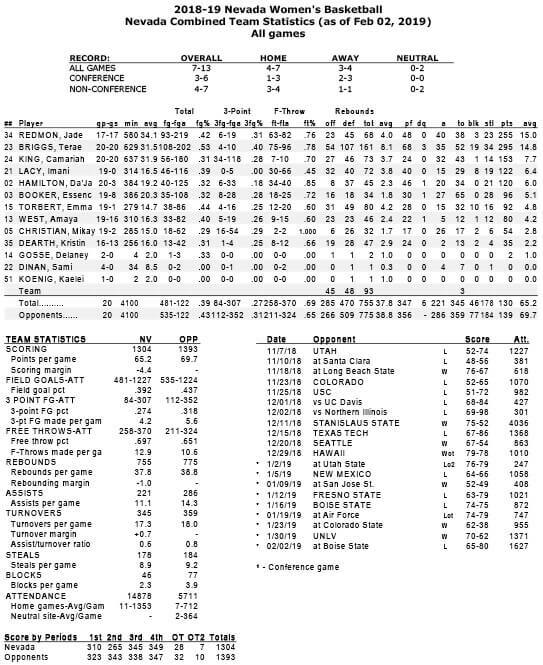 Nevada’s Terae Briggs is affectionately referred to as Gumby for her aptitude to seemingly elongate her limbs to clasp rebounds. In contrast to the elastic character, Briggs is not animated. She leads by example, not loquacity. A 6-foot-3 senior with an elite basketball lineage, Briggs leads the Wolf Pack in rebounds, blocks, steals and is averaging 14.8 points. Briggs’ increased role and production have stretched her game to new heights. Hailing from Pryor, Montana, Briggs generates most of her points on the block with smooth, low-post moves and jump hooks. Her outside shot also as improved, as she has nailed four of 10 attempts from 3-point territory. Along with Briggs’ scoring prowess inside or on the perimeter, athleticism and relentless hustle on the boards have garnered her rubbery moniker with her teammates. Briggs’ calm-and-collected demeanor on the floor sets the standard for a young Wolf Pack squad. She and guard Jade Redmon are the only seniors on the team, which has six true freshmen. Briggs doesn’t use words to get her point across. She lets her play do the talking. Briggs’ love for the game is infectious, which stems from her hoops-heavy family tradition. Briggs has two aunts, uncles and three cousins who played college basketball. Briggs is a Native American from the Crow Nation. Her ancestry had an impact on her decision coming out of Plenty Coups High School. Briggs enrolled at United Tribes Technical College in Bismarck, North Dakota, a tribal community with an enrollment of less than 1,000 students. UTTC wasn’t known for its sports programs, but she made an impact on the basketball team. In her first season with United Tribes, Briggs was named Region XIII MVP and led the Thunderbirds to its first-ever Region Championship. 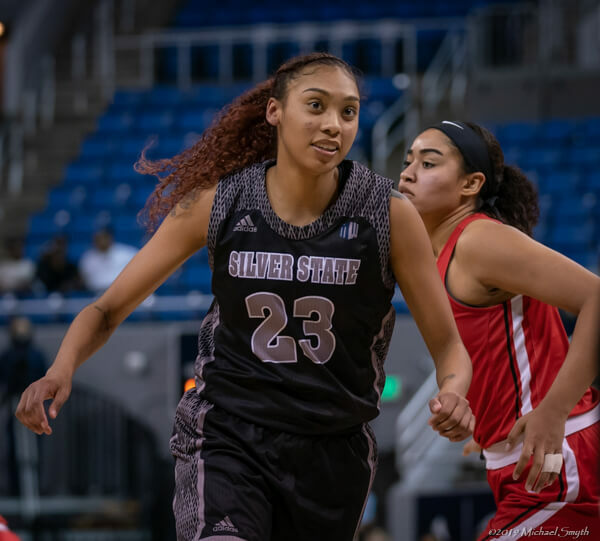 She transferred to Nevada the following season and has logged more than 500 career points and 1,500 minutes in just over two seasons. 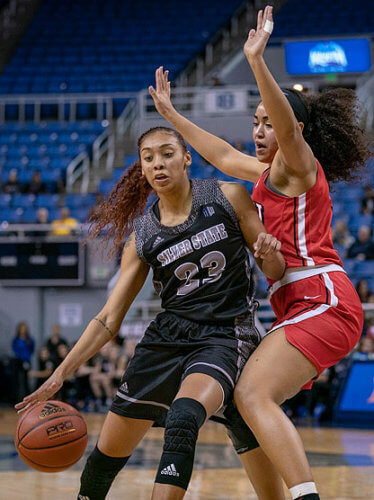 Briggs has improved every aspect of her game this season, and it’s helping the Nevada women’s team rebound from a slow start this season to a 7-13 record. With nine games remaining in the regular season, Briggs and the rest of the Wolf Pack will make one final push in order for a chance at an NCAA Tournament appearance in March. Briggs is double-majoring in human development and family studies. She aims to be a family prevention specialist when her collegiate career concludes. Notes: Nevada (7-13 overall, 3-6 in the Mountain West Conference) hosts Colorado State (8-12, 2-7 in the MW) at 6:30 p.m. Wednesday at Lawlor Events Center. … The Rams lead the all-time series 13-2, but the Wolf Pack devoured their Mountain West foes 62-38 on Jan. 23 in Fort Collins. … Briggs tallied 10 points and a season-high 14 rebounds in the win to post her eighth double-double of the year, which ranks 42nd in the nation. She is in the league in scoring, fifth in rebounding, fourth in field goal percentage, sixth in free-throw percentage, and is tied for 10th in blocked shots.